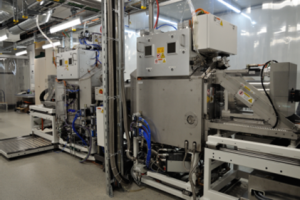 The Singulus Rotaris deposition system is designed to address the current needs for the production of next generation thin films for applications in advanced spintronics, thermoelectrics and optoelectronic research and for the rapid transfer of research results to industry by providing the ability to deposit on industrial sized 8" (200mm) wafers. 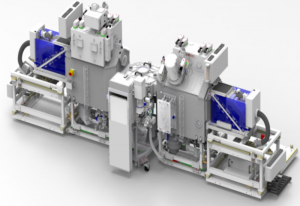 The Singulus Rotaris deposition system is equipped with two Rotating Substrate Modules (RSM) and an in-situ transfer chamber together with three Turbo Molecular Pumps and two cryo-pumps which can easily facilitate UHV deposition. It has the capability to automatically handle up to 25x200mm wafers in a single pump-down cycle. Deposition can be done on heated substrate wafers up to a maximum temperature of 550°C using sequential or co-deposition. With the ability to be operated in manual as well as full automatic mode the Rotaris is designed for both research and industrial environments. It exhibits an extremely high reproducibility even for sub-nm thin films and the unprecedented throughput of up to 20 samples per hour allows for the rapid screening of materials compositions and the development of new multilayer stacks. The RSMs are located in a specially designed clean room environment built especially for this deposition system. The two modules can house up to 18 targets with the possibility to co-sputter in DC, RF and pulsed DC modes. The RSM has advanced features which include the ability to apply both a static and rotating in-plane magnetic fields during deposition as well as in-situ annealing capabilities. It also has an in-situ Ar- ion etcher for cleaning and etching samples and the possibility to add nitrogen and oxygen for reactive sputtering.